Home / Brooklyn / Brooklyn GOP / Brooklyn GOP Radio / Gene Berardelli / Hispanic Leadership Fund / HLF / Mario H. Lopez / Millenial DC / Millenial Strategy Group / People's Republic of New York / Russell Gallo / Travis Korson / WED@9PM - Hispanic Leadership Fund's Mario H. Lopez! 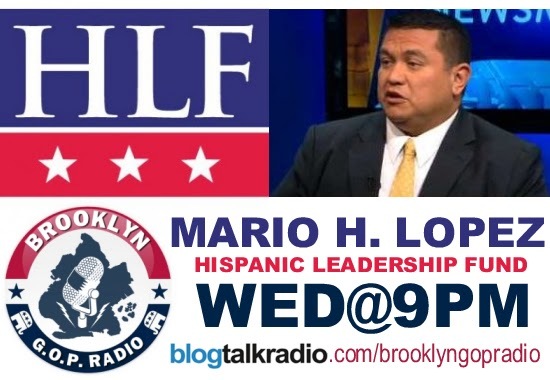 WED@9PM - Hispanic Leadership Fund's Mario H. Lopez! This week, we'll be joined by the Executive Director of the Hispanic Leadership Fund, Mario H. Lopez to discuss recent policy conclusions that indicate skilled immigrants can stimulate economic growth for our nation. The Institute for Policy Innovation has just released a report that concludes that that wages rise fastest in U.S. cities with the greatest influx of highly skilled immigrants. Findings indicate that U.S. cities with the greatest increase of immigrants specializing in the STEM professions (science, technology, engineering and math) between 1990 and 2010 saw an increase in wages for college-educated, native-born Americans by 7 percentage points, and 3 percentage points for the non-college-educated population.In other words, skilled immigrants are good for the economy AND for your pocketbook. Plus, we'll recap the week that was in NY Politics, including the Smith / Halloran Corruption Trial!